Fill a 5 gallon bucket with water. If you use water from the house let it sit for 24 hours to let the chlorine evaporate. 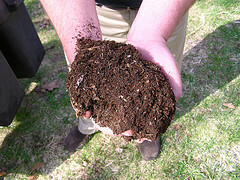 The next day add about 1/2 gallon of compost (give or take) to the water and stir. You can put it in an old pillowcase or a piece of fabric tied with a string and that will make straining your compost tea easier later. Mix or swirl if using a pillowcase. Let it sit 3-7 days and stir well each day. Dilute to 5 parts water to 1 part compost tea. Sprinkle around the soil and don’t let it get on the leaves of your plants or it may burn them if you water with compost tea on a sunny hot day. That’s it! Free fertilizer for your garden. Whew! I’m so glad you didn’t want ME to drink it! I surely was curious as to what you had in mind. i have tried a couple of coopmst bins. To be honest i have gotten the best results just making a pile and leaving it, turning it every couple of weeks. Two drawbacks in my opinion of bins is air circulation and creating a barrier for insects to enter. i had a black coopmst bin which from what i read was a popular model. The contents never got hot. This baffled me for a long time then i decided to just make a pile in a sunny area. after a good rain it gets piping hot.